Holdfast Pacific has the empire of Japan attempt to control the vast Pacific Ocean. After devastating the United States fleet at Pearl Harbor, the Japanese naval, air and land forces push their conquest across the Pacific. Their only obstacles are weakened Allied forces and time as the Allies recover. Can you as the Japanese player secure a Pacific empire that protects your homeland from your enemies? And as the Allied player can you rebuild your armed forces and mount a counter attack that prevents the Japanese expansion and bring the war to their homeland? 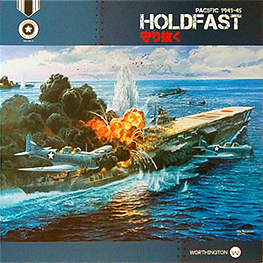 Holdfast Pacific is the 4th volume in our Great Campaigns of World War 2 series. The game uses area movement to contest, battle and control the key Pacific areas in the war. Using wooden blocks with labels as the ships of the great Allied and Japanese fleets, players have hidden movement and battle for control of each sea area. The game also highlights the use of air power, island hopping, and airfield control in each sea zone with the use of air fleets and marines.